Last night, Matt and I went to $6 Tuesday at the movie theater near his apartment to see - wait for it - the last Harry Potter movie. This was my third time seeing it since it came out less than a week ago, and let me just say, it seems like it gets better every time I see it. Maybe because I notice more, between focusing on different things in each scene and not crying as much from one viewing to the next. Either way, though, it's a very good film, and a fitting end to the series. In the final two films of the series, the main protagonists (Harry, Ron, and Hermione) find themselves looking for horcruxes - small items to which the antagonist (Lord Voldemort) has transferred pieces of his soul in an attempt to preserve himself. I don't intend on revealing any specific details, so no need for a spoiler alert. But while I was watching the movie, a few thoughts came to my mind, and I immediately related them to my life and my weight loss progress. My obesity could be personified as the Dark Lord himself; as the hero of my own story, my objective is to destroy the horcruxes, the objects and ideas that give the antagonist strength. As the dark magic is vanquished, their ruler becomes gradually weaker and has less control over me - though, at least initially, it may not seem to be so. Which has also made them easier to destroy. I replaced all drinks with water or the occasional unsweetened tea. I got off the couch and started walking, then Wii Fit-ing, then stair climbing, then working the machines at the gym, then I started to run. And I stopped ordering takeout and started cooking my meals for myself. These are the dark problems I feel confident in saying I have triumphed over. But some issues have been harder to pinpoint - and even harder to kill. I wish it were as "easy" as it sometimes is for Harry - stab Tom Riddle's diary with a basilisk fang and it's done for. But I can't just attack binge eating with a material object, or even with strong thoughts, and have it disappear, leaving me cured of it forever. I have to think about it very closely, study my own patterns and tendencies, look for the vulnerability - and then work hard for the rest of my life defending myself against the dark power I know it has over me. Am I obsessed with weight loss? I honestly don't know how to answer that. I'm as fixated as Harry is with destroying the set of horcruxes he finds himself pursuing - it's the focus of the journey at the moment, but that doesn't mean there aren't moments for comic relief. And just because we don't see Harry eating or sleeping doesn't mean he isn't doing these things; just because the focus of my weight loss blog is, well, weight loss doesn't mean that it's the only thing I ever think about. Binge eating is a multifaceted problem for me, and there is no one cause. And just because I can associate my self-harming tendencies with certain people and events doesn't mean that any one person or experience is entirely at fault. That said, however, the relationship between food and family is very close for many people, and it has certainly been the case for me as well. Just as their good habits have bred mine, their bad habits have encouraged my own negative ones. Something I have struggled with since the beginning of my journey is my evolving identity. Who are we? Are we who we believe ourselves to be or are we the way others perceive us? Identity, like binge eating, is not developed from one single source. I am a product of the people I have known, the experiences I have had, the stories I have heard. I have taken from these and other sources to create a good, hard-working, intelligent, and caring young lady, and I'm endlessly grateful for them and all they've given me. Harry Potter, too, is constantly being helped and guided by friends, family, and teachers - but ultimately, the battle is his own. He needs to face Voldemort himself - there is no other way to defeat him. 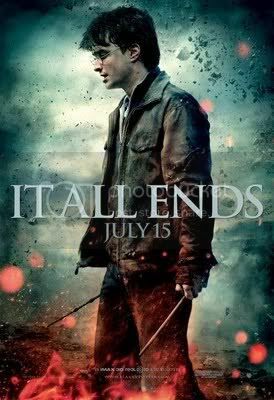 Tomorrow: Part Two, or "July 15: It All Ends"
I liked this entry a lot, and not just because I am a total Potter nerd. This right here, "Am I obsessed with weight loss? I honestly don't know how to answer that." I've wondered that many times myself. I fall asleep thinking about it, I wake up thinking about it, I spend a lot of the day thinking about it. But the thing is, even if I am obsessed, is that such a bad thing? I know that's a controversial response, but I DEFINITELY used to be obsessed with food. Just like someone who was an alcoholic or self-harmer, a lot of the time the thinking and planning of what I was going to eat was the only thing that could calm me down. That being said, is it unhealthy to be obsessed with what I consider to be my "recovery"? I don't really know how to answer that either. But at least we're both thinking about it. Your analogy with the horcruxes is very apt. I am finding as I get further along that there are little nasty ones I didn't even know about in addition to the major players like alcohol and take-out. I think weight loss HAS to be an obsession or it isn't going to work. I stopped dieting for a number of years because I didn't have/want to devote the time and energy that this requires. This is something I have to think about all the time, every day. I think the other commenter is absolutely right...I have traded an obsession with food for an obsession with weight loss and I'm okay with that. Emotionally eating is such a monster! Talking with my husband has really helped me beat this monster. There are occasions when I do binge eat, but they are definitely fewer times than in my past. I know you are getting closer to Matt, but are you close enough to talk to him about the times when you want to binge? Just a thought. Thanks for the post. I think writing it out is healing too. I think you are amazing. Nice job on the seven miles today, by the way. Tomorrow's post should be interesting. Your posts always are, of course.